One of the best things that has come out of my garden from last year is rosemary. Rosemary is such a fragrant, beautiful and delicious herb. And I use it in almost everything. Most recipes I use seem to call for rosemary and it’s no wonder: it’s a lovely little herb. In fact, in the Middle Ages brides wore rosemary headpieces for their weddings. I bring this up because it’s now April and my rosemary survived the winter and is still in my garden from last year. I was glad it was still growing because I wanted to use fresh rosemary for this recipe. It was a gloomy Monday night–the kind of night when you really just don’t want to put much effort into cooking after a long day. I chose this recipe because it was simple and we had everything needed to do it. Wash and thoroughly dry the chicken pieces, then liberally sprinkle with kosher salt and pepper. Heat the oil in the skillet under on a high heat until it gets hot, but does not burn. Place the thighs in the oil, skin side down (depending on how many you are using and how big the skillet is, you might want to work in two batches). After three to four minutes, the skin should be a crisp brown, and the thighs should easily lift off the skillet without sticking. Usually skin stuck to the pan indicates it has not thoroughly crisped. Turn the thighs over to crisp the other side, but this time, remove the chicken after only two to three minutes. Drain any excess oil from the pan, turn on the heat, and deglaze the pan with the wine. 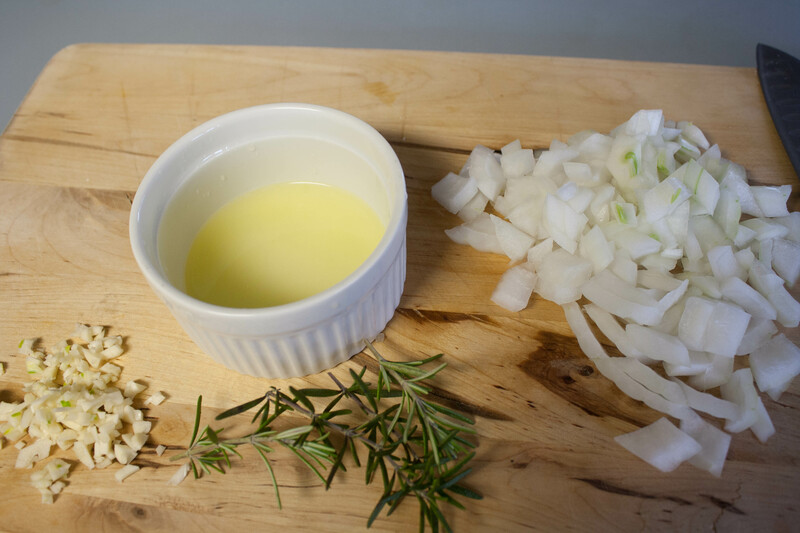 Add the chopped garlic, a splash more wine or even some chicken stock for moisture, and the rosemary. Put the chicken back in the pan, and leave on the stove at medium heat for a few minutes, or place in the oven at 300 degrees for five to ten minutes. I prepped everything needed for the recipe. 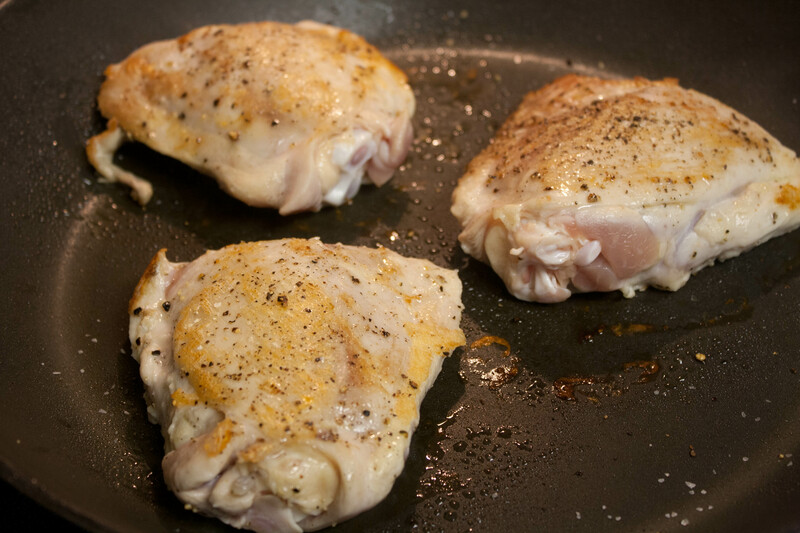 Michael worked on the chicken in the skillet–sans the chicken skin. We removed the skin from the chicken thighs but that didn’t matter. The recipe still worked. 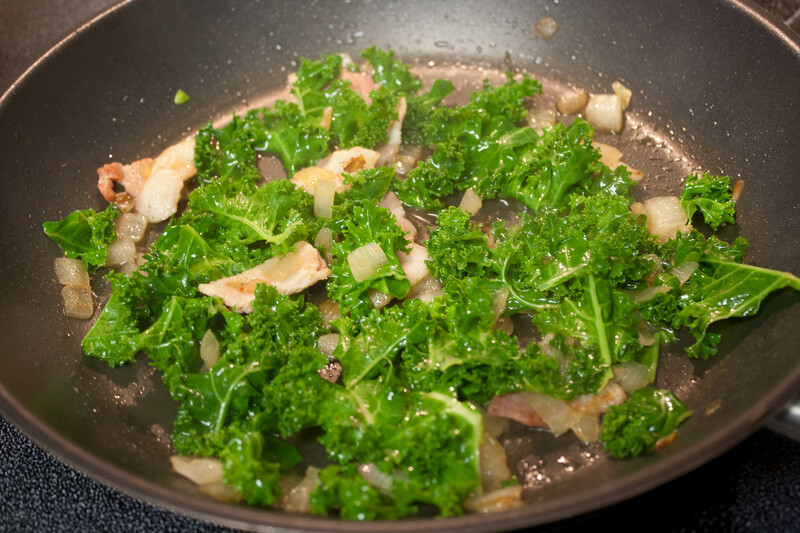 While he was doing that, I cooked some onions and kale in another skillet to go with the chicken. 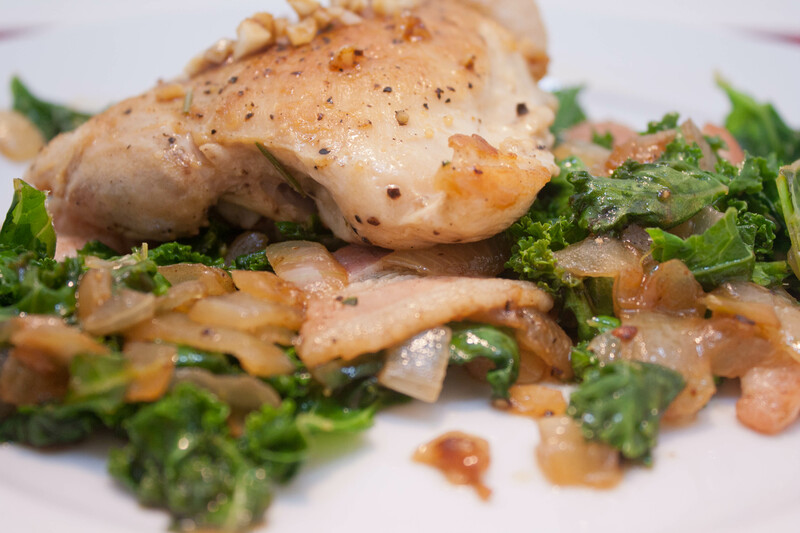 I sauteed the onions, added the kale and one slice of bacon chopped up and a little splash of chicken stock. Everything came together nicely. The chicken was crispy yet juicy on the inside. 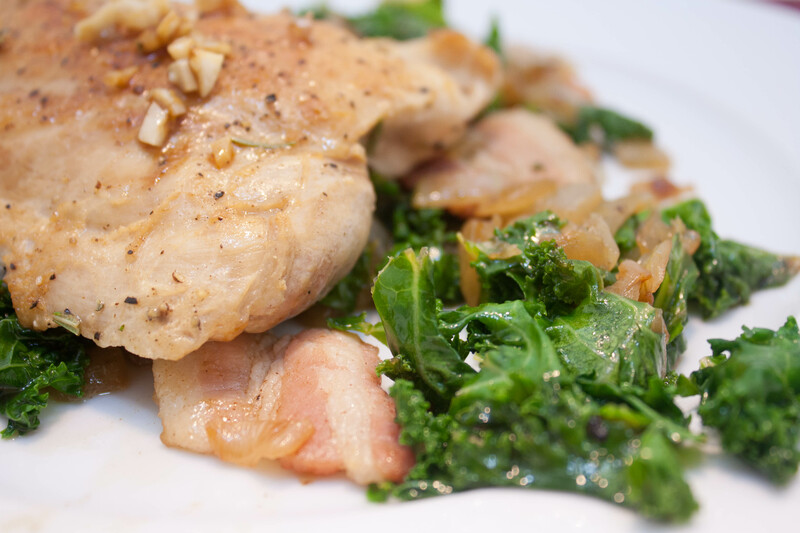 The kale worked well with the chicken, too. Another bonus: dinner was less than 500 calories total. My only complaint? The lemon juice was overpowering. The recipe did not specify how much lemon juice to use and it’s so easy to overdo lemon. If I made this recipe again I’d use way less lemon juice! QUESTION: Are you a lemon fan? Hi Lisa. ABSOLUTELY a lemon fan. AND a rosemary fan. YAY that your plant survived the winter!!! (my sage and thyme did the same, though they sure look a bit worse for the wear right now) Have a wonderful Saturday. Delicious kind of food..I cant wait to try it..Thanks for sharing with us..
and here I am never having consumed the thigh of the chicken!! Miz recently posted..Happy anniversary! We’re both 20(ish)! It’s darker meat, a little higher in fat, but much more delicious! ahhh. The beauty of the chickens picture just smacked my eyeballs in their face. I love the simplicity of this dish. It looks so tasty! 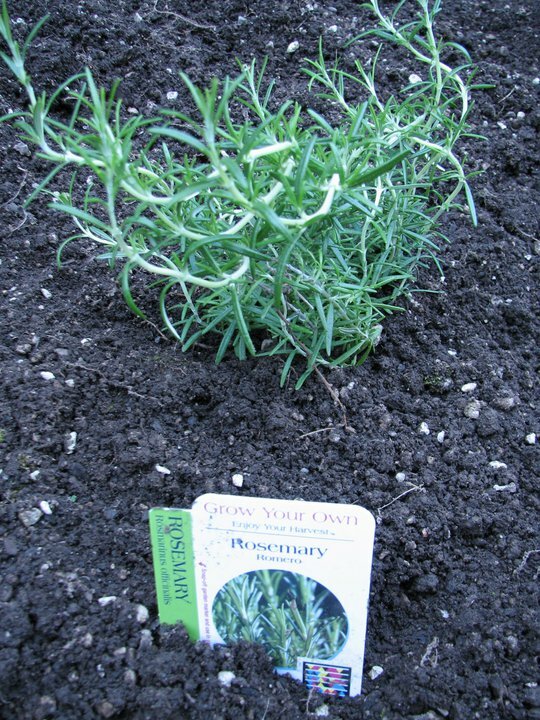 I’ve never had rosemary (gasp!). I must do this. Give fresh rosemary a try. It has such a beautiful, strong, aroma. Fresh rosemary makes most dishes ten times better. When we do homemade pizza we add chopped rosemary to the dough.